We got some much needed rain all last night into the early morning. The most rain we’ve had in a while, it was getting kind of dry around here. As the rain moved it out it took all the humidity with it. The day was a beautiful sunny and fall like day. Tomorrow they said it would struggle to reach 70 degrees, smells like Fall! For dinner tonight, Progresso Kitchen Favorites Classic Lasagna w/ Whole Grain Bread. 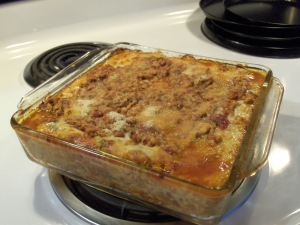 This is my favorite Lasagna recipe, the Progresso Kitchen Favorites Classic Lasagna! It’s very easy to make as the dinner kit contains the Lasagna Pasta, Tomato Herb sauce, Ricotta Sauce Mix, and Grated Parmesan Cheese. I added 1 lb. Jennie – O Extra Lean Ground Turkey Breast, 1 Cup water, Sliced Baby Bella Mushrooms, 2/3 Cup 2% Milk, 1 (8 oz. ), Sargento Reduced Fat Shredded Mozzarella Cheese (2 Cups), 1/2 cup Shredded Dutch Gouda, and I also added a bit more seasoning (McCormick Grinder Italian Herb). I combined the Mozzarella and Goda Cheese. Gouda is such a great tasting Cheese and is a perfect melting Cheese. Basically you just layer your ingredients in a 8″ square baking dish and cover and bake at 425 degrees for 30 minutes and bake an additional 10 minutes uncovered. The product description along with full instructions are at the bottom of the post. Prepared by the instructions it was 390 calories but I cut that and the carb count down by using Jennie O Extra Lean Ground Turkey Breast instead of Beef and Sargento Reduced Fat Mozzarella Cheese. The Lasagna comes out delicious every time! Everyone really loves this. The flavor as always is excellent. The Sauce was thick and well seasoned and the same for the pasta, perfect, plus plenty leftovers to freeze for later. I also had a slice of Healthy Life Whole Grain Bread. For dessert later a new one, Jello Chocolate Mousse. Easy to prepare, very tasty, and 160 calories per serving. I served it topped with Coll Whip Free. Ready to bake in about 20 minutes. You Will Need: 1 lb lean ground beef; 1 cup water; 2/3 cup 2% milk; 1 bag (8 oz) reduced fat or fat-free shredded mozzarella (2 cups); nonstick cooking spray and foil. Sauce:Heat oven to 425 degrees F. Brown beef in 10-inch skillet, breaking up beef into small pieces; drain. Stir Tomato Herb Sauce and water into beef; heat to boiling. Reduce heat; simmer 3 to 5 minutes, stirring occasionally. Meanwhile, mix Ricotta Sauce Mix and milk in liquid measuring cup or small bowl, using whisk or fork. Layer: Spray 8-inch square glass baking dish with cooking spray. Layer lasagna: Spread about 2/3 cup beef sauce in dish. Layer with 2 uncooked Pasta sheets (side by side), 2/3 cup beef sauce (cover Pasta with sauce), 1/4 cup ricotta sauce and 1/2 cup mozzarella. Repeat layers twice, starting with Pasta. Add remaining Pasta, beef sauce and mozzarella. Sprinkle with Parmesan Cheese. Kitchen Tip: Substitute 1/4 cup dry red wine for 1/4 cup of the water. Bake: Cover and bake for 30 minutes, uncover and bake for another 10 minutes. Add beef & cheese! Quality Foods. Quality ingredients included. Lasagna pasta; tomato herb sauce; ricotta sauce mix; grated parmesan cheese. Exchanges: 2 starch, 3-1/2 medium fat meat. Carbohydrate Choices: 2. Made with quality ingredients. Progresso Kitchen Favorites dinners combine high quality ingredients to create delicious meals that become family favorites! 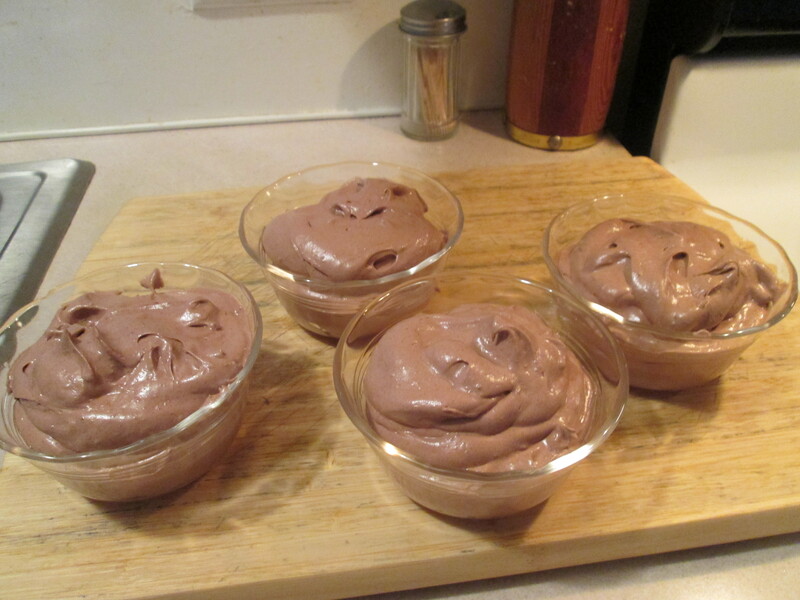 * Pour 1 cup cold milk into mixing bowl; add mousse mix. Beat withelectric mixer on low speed 30 sec., Then beat on medium speed 4minutes. (Do not under mix.) Spoon into serving dishes. Refrigerate 1-2hours (product will be slightly softer at 1 hr). Store refrigerated.Makes 4 (1/2 cup) servings. Another Spring like day in August, we’ll take it! I rarely play the lottery but had to take a chance on it today, Powerball topping out at $400 Million! Odds are against you winning it but as they say someone has to win it, so it might as well be me! For dinner tonight a family favorite, Progresso Kitchen Favorites Classic Lasagna w/ Baked Artisan Multi Grain Bread. This has become one of our favorite Lasagna recipes, Progresso Kitchen Favorites Classic Lasagna! It’s very easy to make as the dinner kit contains the Lasagna Pasta, Tomato Herb sauce, Ricotta Sauce Mix, and Grated Parmesan Cheese. I added 1 lb. Jennie – O Lean Ground Turkey, 1 Cup water, Sliced Baby Bella Mushrooms, 2/3 Cup 2% Milk, 1 (8 oz.) Shredded Mozzarella Cheese (2 Cups), 1/2 cup Shredded dutch Gouda, and I also added a bit more seasoning (McCormick Grinder Italian Herb). I combined the Mozzarella and Goda Cheese. Gouda is such a great tasting Cheese and is a perfect melting Cheese. Basically you just layer your ingredients in a 8″ square baking dish and cover and bake at 425 degrees for 30 minutes and bake an additional 10 minutes uncovered. The product description along with full instructions are at the bottom of the post. Prepared by the instructions it was 390 calories but I cut that and the carb count down by using Honeysuckle White Extra Lean Ground Turkey instead of Beef and Sargento Reduced Fat 2% Mozzarella Cheese. The Lasagna came out delicious every time! Everyone really loves this. The flavor as always is excellent. The Sauce was thick and well seasoned and the same for the pasta, perfect, plus plenty leftovers to freeze for later. I also baked a loaf of the La Brea Bakery Take and Bake Artisan Multi Grain Loaf for Mom and Dad and I had Healthy Life Whole Grain Bread. For dessert later a Jello Sugarless Double Chocolate Pudding. Ready to bake in about 20 minutes. You Will Need: 1 lb lean ground beef; 1 cup water; 2/3 cup milk; 1 bag (8 oz) shredded mozzarella (2 cups); nonstick cooking spray and foil. CHILLY this morning about 35 degrees, 31 tomorrow morning with a freeze warning! Come on Mother Nature with that warm weather. Being Mother’s Day I gave Mom a choice of what to have for Dinner. We thought about going to one of the local Steakhouses but Mom decided she wanted to eat at home and she wanted Lasagna. So for dinner I prepared; Progresso Kitchen Favorites Classic Lasagna w/ Baked Artisan Multi Grain Bread. As always I substitute Extra Lean Ground Turkey for the Beef. This has become one of our favorite dinners and our favorite Lasagna recipes, Progresso Kitchen Favorites Classic Lasagna! It’s very easy to make as the dinner kit contains the Lasagna Pasta, Tomato Herb sauce, Ricotta Sauce Mix, and Grated Parmesan Cheese. I added 1 lb. Jennie – O Lean Ground Turkey, 1 Cup water, 2/3 Cup 2% Milk, 1 (8 oz.) Shredded Mozzarella Cheese (2 Cups), 1/2 cup Shredded dutch Gouda, and I also added a bit more seasoning (McCormick Grinder Italian Herb). I combined the Mozzarella and Goda Cheese. Gouda is such a great tasting Cheese and is a perfect melting Cheese. Basically you just layer your ingredients in a 8″ square baking dish and cover and bake at 425 degrees for 30 minutes and bake an additional 10 minutes uncovered. The product description along with full instructions are at the bottom of the post. Prepared by the instructions it was 390 calories but I cut that and the carb count down by using Honeysuckle White Extra Lean Ground Turkey instead of Beef and Sargento Reduced Fat 2% Mozzarella Cheese. The Lasagna came out delicious every time! Everyone really loves this. The flavor as always is excellent. The Sauce was thick and well seasoned and the same for the pasta, perfect, plus plenty leftovers to freeze for later. I also baked a loaf of the La Brea Bakery Take and Bake Artisan Multi Grain Loaf. For dessert later a Healthy Choice Chocolate Swirl Frozen Yogurt. Ready to bake in about 20 minutes. You Will Need: 1 lb lean ground beef; 1 cup water; 2/3 cup milk; 1 bag (8 oz) shredded mozzarella cheese (2 cups); nonstick cooking spray and foil. Sauce: Heat oven to 425 degrees F. Brown beef in 10-inch skillet, breaking up beef into small pieces; drain. Stir Tomato Herb Sauce and water into beef; heat to boiling. Reduce heat; simmer 3 to 5 minutes, stirring occasionally. Meanwhile, mix Ricotta Sauce Mix and milk in liquid measuring cup or small bowl, using whisk or fork. Layer: Spray 8-inch square glass baking dish with cooking spray. Layer lasagna: Spread about 2/3 cup beef sauce in dish. Layer with 2 uncooked Pasta sheets (side by side), 2/3 cup beef sauce (cover Pasta with sauce), 1/4 cup ricotta sauce and 1/2 cup mozzarella. Repeat layers twice, starting with Pasta. Add remaining Pasta, beef sauce and mozzarella. Sprinkle with Parmesan Cheese. Kitchen Tip: Substitute 1/4 cup dry red wine for 1/4 cup of the water. 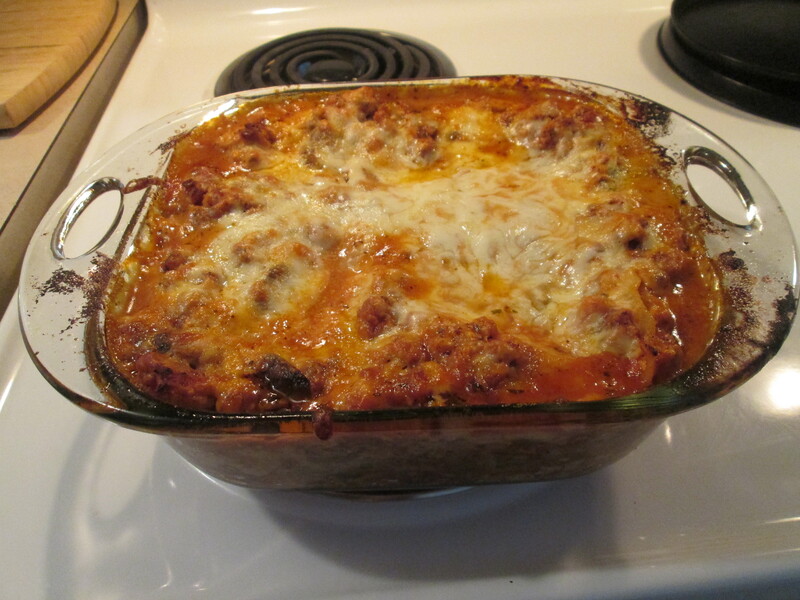 This has become one of my favorite dinners , Progresso Kitchen Favorites Classic Lasagna! It’s very easy to make as the dinner kit contains the Lasagna Pasta, Tomato Herb sauce, Ricotta Sauce Mix, and Grated Parmesan Cheese. I added 1 lb. Jennie – O Lean Ground Turkey, 1 Cup water, 2/3 Cup 2% Milk, 1 (8 oz.) Shredded Mozzarella Cheese (2 Cups), 1 cup Shredded dutch Gouda, and I also added a bit more seasoning (McCormick Grinder Italian Herb). I combined the Mozzarella and Goda Cheese. Gouda is such a great tasting Cheese and is a perfect melting Cheese. Basically you just layer your ingredients in a 8″ square baking dish and cover and bake at 425 degrees for 30 minutes and bake an additional 10 minutes uncovered. The product description along with full instructions are at the bottom of the post. Prepared by the instructions it was 390 calories but I cut that and the calorie and carb count down by using Honeysuckle White Extra Lean Ground Turkey instead of Beef and Sargento Reduced Fat 2% Mozzarella Cheese. The Lasagna came out delicious every time! Everyone really loves this. The flavor as always is excellent. The Sauce is thick and well seasoned and the same for the pasta, perfect, plus plenty leftovers to freeze for later. I had a side of Walmart Bakery Garlic Knot Bread. Just heat on 425 degrees for about 6 – 8 minutes and serve. This has become one of our favorite dinners and our favorite Lasagna recipes, Progresso Kitchen Favorites Classic Lasagna! It’s very easy to make as the dinner kit contains the Lasagna Pasta, Tomato Herb sauce, Ricotta Sauce Mix, and Grated Parmesan Cheese. I added 1 lb. Jennie – O Lean Ground Turkey, 1 Cup water, 2/3 Cup 2% Milk, 1 (8 oz.) Shredded Mozzarella Cheese (2 Cups), 1 cup Shredded dutch Gouda, and I also added a bit more seasoning (McCormick Grinder Italian Herb). I combined the Mozzarella and Goda Cheese. Gouda is such a great tasting Cheese and is a perfect melting Cheese. Basically you just layer your ingredients in a 8″ square baking dish and cover and bake at 425 degrees for 30 minutes and bake an additional 10 minutes uncovered. The product description along with full instructions are at the bottom of the post. Prepared by the instructions it was 390 calories but I cut that and the carb count down by using Honeysuckle White Extra Lean Ground Turkey instead of Beef and Sargento Reduced Fat 2% Mozzarella Cheese. The Lasagna came out delicious every time! Everyone really loves this. The flavor as always is excellent. The Sauce was thick and well seasoned and the same for the pasta, perfect, plus plenty leftovers to freeze for later. I had a side of Healthy Life Whole Grain Bread that I buttered with I Can’t Believe It’s Not Butter and then sprinkled Shredded Parmesan Cheese and Sargento Shredded Provolone/Mozzarella on it. Then I baked for 10 minutes at 400 degrees until the bread was toasted. For dessert/snack later a 100 Calorie Mini Bag of Jolly Time Popcorn. Being in a wheelchair in the rain is tough! But you have to go on and get what you have to do done. That was grocery shopping, errands, and visiting my Dad at the Rehab Center. So what better way to warm a cold and rainy day than Lasagna! 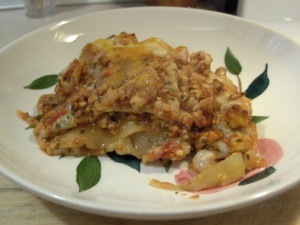 I used Progresso Kitchen Favorites Classic Lasagna! It’s very easy to make as the dinner kit contains the Lasagna Pasta, Tomato Herb sauce, Ricotta Sauce Mix, and Grated Parmesan Cheese. I added 1 lb. Jennie – O Lean Ground Turkey, 1 Cup water, 2/3 Cup 2% Milk, 1 (8 oz.) Shredded Mozzarella Cheese (2 Cups), 1 cup Shredded Dutch Gouda, sliced Baby Bella Mushrooms (first time I added these) and I also added a bit more seasoning (McCormick Grinder Italian Herb). I combined the Mozzarella and Goda Cheese. Gouda is such a great tasting Cheese and is a perfect melting Cheese. Basically you just layer your ingredients in a 8″ square baking dish and cover and bake at 425 degrees for 30 minutes and bake an additional 10 minutes uncovered. The product description along with full instructions are at the bottom of the post. Prepared by the instructions the Lasagna is 390 calories and 24 carbs but I cut the calorie and the carb count down by using Honeysuckle White Extra Lean Ground Turkey instead of Beef and Sargento Reduced Fat 2% Mozzarella Cheese. The Lasagna came out delicious as usual! Everyone really loves this. The flavor as always is excellent. The Sauce was thick and well seasoned and the same for the pasta, perfect. I prepared a side of Market Side Fresh Italian Bread that I buttered with I Can’t Believe It’s Not Butter and then baked it at 400 degrees for 12 minutes. For dessert later a Jello Sugar Free Dark Chocolate Pudding, 60 calories and 14 carbs. I wanted some Lasagna for dinner and when it’s Lasagna it’s Progresso Kitchen Favorites Classic Lasagna! Its was very easy to make as the dinner kit contains the Lasagna Pasta, Tomato Herb sauce, Ricotta Sauce Mix, and Grated Parmesan Cheese. I added 1 LB. Lean Ground Turkey, 1 Cup water, 2/3 Cup 2% Milk, 1 (8 oz.) Shredded Mozzarella Cheese (2 Cups), and I also added a bit more seasoning (McCormick Grinder Italian Herb). Basically you just layer your ingredients in a 8″ square baking dish and cover and bake at 425 degrees for 30 minutes and bake an additional 10 minutes uncovered. The product description along with full instructions are at the bottom of the post. Prepared by the instructions it was 390 calories but I cut that and the carb count down by using Honeysuckle White Extra Lean Ground Turkey instead of Beef and Sargento Reduced Fat 2% Mozzarella Cheese. The Lasagna came out delicious again! Everyone really loves this. I’ve got a quick and easy way to have Lasagna now. The flavor was excellent. The Sauce was thick and well seasoned and the same for the pasta, perfect. I had a side of Aunt Millie’s Whole Grain Bread that I buttered with I Can’t Believe It’s Not Butter and then sprinkled Shredded Parmesan Cheese and Sargento Shredded Provolone/Mozzarella on it. Then I baked for 10 minutes until the the bread was toasted. For dessert later a slice of Pillsbury Nut Quick Bread topped with a scoop of Breyer’s Carb Smart Ice Cream. Today’s Menu: Baked Red Snapper With Garlic w/ Asparagus, Golden Sweet Corn, and Whole Grain Bread. They had a fantastic selection of Red Snapper Fillets at Kroger’s Seafood Department this morning. So needless to say it was Red Snapper for dinner tonight, Baked Red Snapper With Garlic w/ Asparagus, Golden Sweet Corn, and Whole Grain Bread. i tried a new recipe for the Red Snapper, Baked Red Snapper With Garlic. Place the snapper fillets in a baking dish which has been sprayed with Pam Baking Spray. In a skillet, melt butter with garlic, Worcestershire sauce, Creole seasoning blend, pepper, parsley, and chives, if using. Cook on low for 2 minutes, just to blend flavors. Brush both sides of fish fillets with the butter and herb mixture. Toss bread crumbs in the remaining butter mixture; sprinkle over the fillets. Bake at 400° for about 12 minutes, depending on thickness of fillets, until fish flakes easily and is no longer translucent. The full recipe and instructions are listed at the bottom of the post. I have a new favorite Red Snapper recipe! This turned out lip smacking delicious. The butter, spices, and bread crumbs combine to make the Red Snapper burst with flavor. This is a keeper recipe. For side dishes I had Asparagus, the leftover Golden Sweet Corn, and Healthy Life Whole Grain Bread. The Asparagus comes from Kroger Produce and it come’s in a microwavable steaming bag. Heat for 2 – 3 minutes and it’s done, about 2 servings per bag and it’s 20 calories and 7 carbs. The Sweet Corn was leftover from last night, I just reheated it in the microwave. For dessert a Jello Sugarless Chocolate pudding. 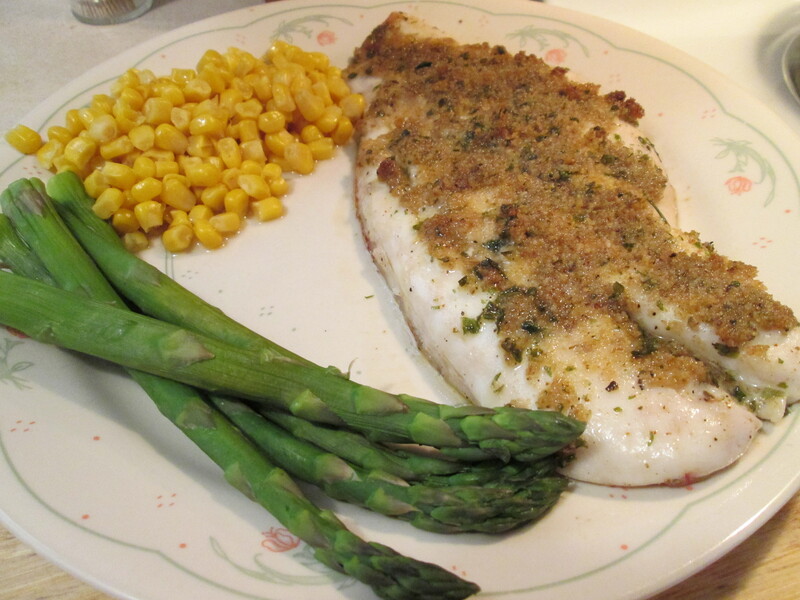 Place snapper fillets in a baking dish which has been sprayed with a butter-flavored baking spray. In a skillet, melt butter with garlic, Worcestershire sauce, Creole seasoning blend, pepper, parsley, and chives, if using. Cook on low for 2 minutes, just to blend flavors. Brush both sides of fish fillets with the butter and herb mixture. Toss bread crumbs in the remaining butter mixture; sprinkle over the fillets. Bake at 400° for about 12 minutes, depending on thickness of fillets, until fish flakes easily and is no longer translucent. I made this for the first time back in July and can’t wait to till we have it again, Progresso Kitchen Favorites Classic Lasagna. It was very easy to make as the dinner kit contained the Lasagna Pasta, Tomato Herb sauce, Ricotta Sauce Mix, and Grated Parmesan Cheese. I added 1 LB. Lean Ground Turkey, 1 Cup water, 2/3 Cup 2% Milk, 1 (8 oz.) Shredded Mozzarella Cheese (2 Cups), and I also added a bit more seasoning (McCormick Grinder Italian Herb). Basically you just layer your ingredients in a 8″ square baking dish and cover and bake at 425 degrees for 30 minutes and bake an additional 10 minutes uncovered. The product description along with full instructions are at the bottom of the post. Prepared by the instructions it was 390 calories but I cut that and the carb count down by using Honeysuckle White Extra Lean Ground Turkey instead of Beef and Sargento Reduced Fat 2% Mozzarella Cheese. The Lasagna came out delicious again! Everyone really loves this. I’ve got a quick and easy way to have Lasagna now. The flavor was excellent. The Sauce was thick and well seasoned and the same for the pasta, perfect. I had a side of Aunt Millie’s Whole Grain Bread that I buttered with I Can’t Believe It’s Not Butter and then sprinkled Shredded Parmesan Cheese on it. Then I baked for 10 minutes until the the bread was toasted. For dessert later a bowl of Blue Bunny Natural Frozen Chocolate/Vanilla Swirl Yogurt. Wow what a change in our weather around here! As they say if you don’t like the weather in Ohio stick around a day it will change. Beautiful Summer day (84 degrees) yesterday and a gorgeous Fall day today! Woke up and it was 42 degrees this morning and a high only in the low 60’s, but sunny. On to dinner! When I switched over to buying Bison about 3 years ago instead of Beef the Bison Sirloin Steaks were $7.99 for a package of 2. Wednesday when I went to Kroger they were $11.99!! They are slowly forcing me back to Beef, which is what I grilled for dinner tonight, Sirloin Steak. Love that Bison but prices at Kroger are driving me away. Anyway i grilled a Sirloin Steak that I purchased from Walmart Friday. I rubbed a light coating of Extra Virgin Olive Oil on it and seasoned it with McCormick Grinder Sea Salt and Black Peppercorn. The Extra Virgin Olive Oil not only keeps the Steak from sticking to the grill but also gives it great flavor and helps brown. I grilled it for 4 minutes per side and it came out just right, medium rare. As their commercials tell you it’s hard to beat Walmart Steaks. For sides I prepared Lobster Mac & Cheese and a Baked Potato. First time I made the Lobster Mac. Made it the easy way by using a 2 serving Chef Boyardee Mac & Cheese – Microwavable and Bos’n Langinstino Pre Cooked Lobster. I microwaved the Mac & Cheese and then removed it from it’s container and then put it in a ramekin along with the precooked Lobster, stirred until well mixed. Topped it with Progresso Italian Style Bread Crumbs and broiled it in the oven until the top browned. Came out really well, look forward to trying this as a main dish soon. The creamy mac and the sweet Lobster is a great pairing. 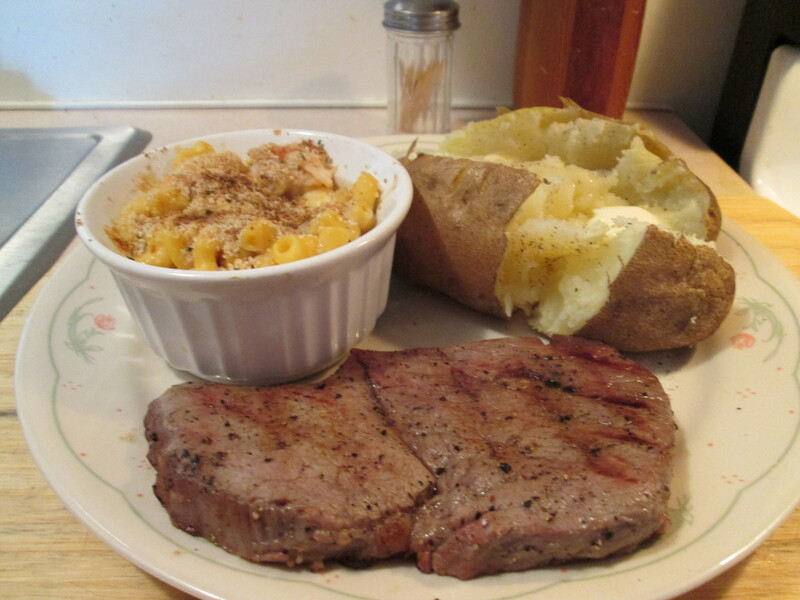 I also had a Baked Potato and 1 slice of Healthy Life Whole Grain Bread. For dessert later a slice of Pillsbury Nut Quick Bread topped with a scoop of Breyer’s Carb Smart Vanilla Ice Cream.